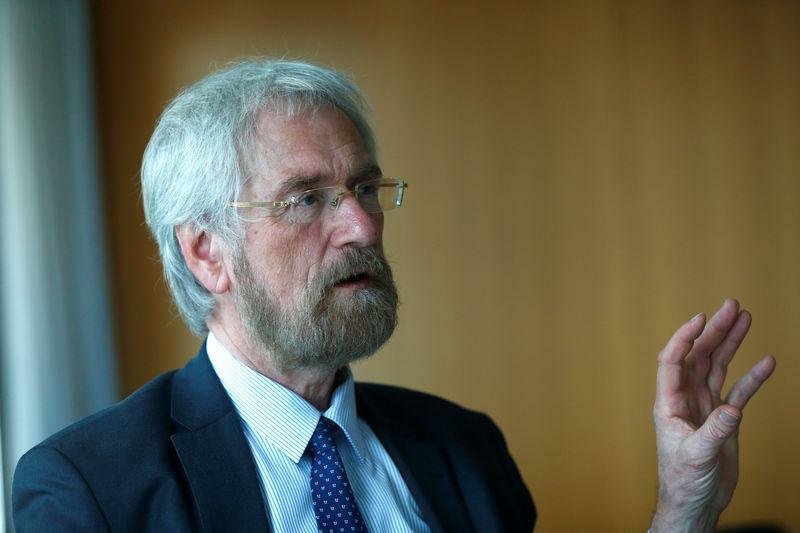 WASHINGTON (Reuters) - Market expectations of a further delay in the European Central Bank's first post-crisis rate hike have created the financial stimulus needed to lift inflation, ECB Chief Economist Peter Praet said on Friday. Money markets are not pricing in a rate hike from the ECB for the next 21 months after investors pushed back their expectations by around a year in recent weeks due to weak growth and cautious rhetoric from policymakers. Their positioning, as measured by the Overnight Indexed Swap (OIS) curve, appears to be out of sync with the ECB's own guidance for rates to stay at their current, rock-bottom level only until the end of this year. But the ECB has long emphasised that this so called lift-off depends on economic conditions and its president, Mario Draghi, said at a conference last month the guidance could still change, as it has done before. "The OIS curve that came after the Watchers' conference in Frankfurt is something that fits well with how we think financial conditions should be today," Praet said. He added that he still believed in the ECB's base scenario of growth bottoming out in the second quarter, then rebounding in the second half. Still, Praet cautioned that the ECB could still provide more stimulus if necessary, even though he did not see a case for restarting asset purchases, commonly known as quantitative easing or QE. "Going back to QE? I don’t see a reason why. But clearly all instruments are available. Can it be rates, can it be QE? All instruments are available. But we think that the framework we have now works pretty well," Praet said. He added that asset purchases work through compressing the term premium, which is currently unnecessary given the flat yield curve. Praet also said the central bank was still open to studying the idea of a tiered deposit rate, which could shield lenders from some of the cost of the ECB's charge on excess reserves. "For tiering, the attitude is for openness, to listen to what it is," Praet said.